Sunday being a special day, Students are free from their Schools & Collages, Office guys are free from office, Business persons are busy with their work as they get more customers on Sunday as compared to other days, In the same ways, Online eCommerce websites are also in a race to gain more & more customers and sell their products. 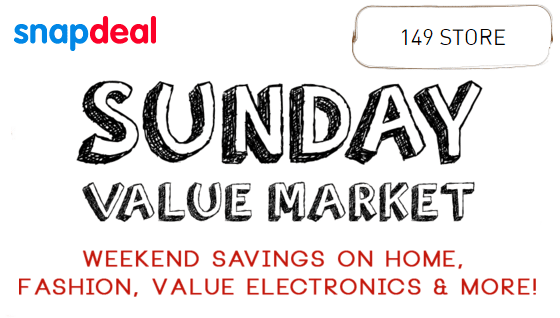 After Shopclues, Paytm – Now Snapdeal is offering the ‘Sunday Value Market’, Get Discounted deals & offers valid only on Sunday. Great Deals under Rs.149 , Stores such as 149 Store, 199 Store, 299 Store & etc will offer you budget deals across snapdeal shopping platform. Grab this offer Now! Pay for your order & Enjoy your Deal!